The founder of Seattle-based dance troupe Hurairi Mana is also the director of museum services at the Wing Luke and an Arts Corp teacher. What do you do? I am the founding leader of Huraiti Mana, a Seattle-based, empowering Polynesian dance troupe; director of museum services at the Wing Luke Museum of the Asian Pacific American Experience; and master teaching artist with Arts Corps, a revolutionary arts-education initiative. My works of social empowerment interweave. My Arts Corps hula class at Hazel Valley Elementary performed at the Wing’s exhibit opening, which featured my fresh-flower lei craftsmanship from Huraiti Mana! How did you get started in those fields? It started with a passion for dance. 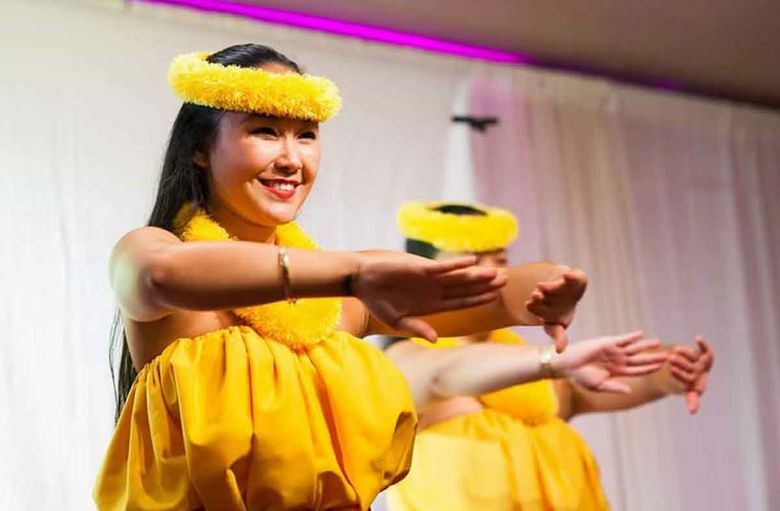 After moving from Hawaii in 2009, I convinced Seattle University Athletics to create a Tahitian dance class — it was my first job. I also taught for seven years with the Hawaii Club. In 2013, I interned with entrepreneur Louie Gong, who connected the idea of indigeneity and social justice into an artistic business. His work led me to the Wing, and from there, to Julz Ignacio of Arts Corps. Through these people-of-the-land and institutions-for-the-people, I realized I wasn’t simply teaching dance — I was sharing interconnectedness, heritage, empowerment, spirituality and pride. Enter, Huraiti Mana. What surprises people about what you do? That I could possibly manage it all! I snag eight hours (or more!) of sleep and make time to see my twin nephews, my mother, my soon-to-be mother-in-law, and the rest of the ‘ohana. How do I do it? With the aloha of my community and most of all, my ku’uipo — my sweetheart. My ku’uipo is there through the dreams-made-reality – through the sweat and the tears. What’s the best part of the work? Learning from and engaging with all the people I meet. I am ha’api’i, which in the Tahitian language is the same word meaning both “to teach” and “to learn.” Whenever I teach through my work, I gain and learn tenfold. The fiery minds of my students and staff spark imaginative solutions to issues faced by indigenous cultures. Nonprofit organizations motivate me to establish meaningful relationships with communities. It’s fulfilling stuff. Do you have a cool job or know someone in the Seattle area who does? Email us with your recommendations for people to feature in Cool Job.